Join the discussion on our forums! Come discuss Brainstormer over in our dedicated Brainstormer discussion topic. I'm actually very optimistic about this card. Could be a sleeper. Though, i'm ready to be horribly wrong. Decks that use lots of spells don't really care about minions. If you really want a card like this then use Twilight Drake. Only costs 1 more, has 1 more attack, is a dragon and counts all cards in your hand. Tried it in Malygos Rogue. On turn 3, it was consistently a 3/5 or more each game. Definitely worth a spot in my book. Edit: Played some more games. Probably not an optimal inclusion, but still interesting nonetheless. Twilight Drake scales with all cards in your hand, and it is still not played that often. This is just worse. If played on curve it would be maximum 3 mana 3/8, but you need the coin, all cards as spells and only hero powering until turn 3. Getting it to a 3/5 is more realistic, but you need to have a lot of spells and keep them in hand, so it is not good versus aggro. At that point might as well use a Lone Champion. If you are playing late game style with a full hand, then the extra health stats would not do much, also better use Mountain Giant. 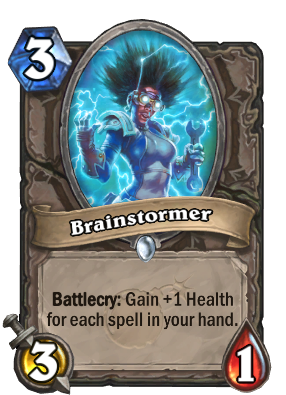 Brainstormer is just here for low-rolls of random 3-cost summon effect. Even if hand mage is a thing, this won't be in it. Like a budget Twilight Drake, except it also only takes spells so its health won't be nearly as good. Hand mage might become a deck? I'd love to try that one. Vanilla with three spells in hand. This card is dust unless you want to build a deck around a 3mana common neutral minion with no immediate effect. But this is not how brainstorming works. Seriously, don't try this. What? Is a worst drake.